Radon is the 2nd leading cause of lung cancer after smoking in Canada, and attributed to 16% of lung cancer deaths. 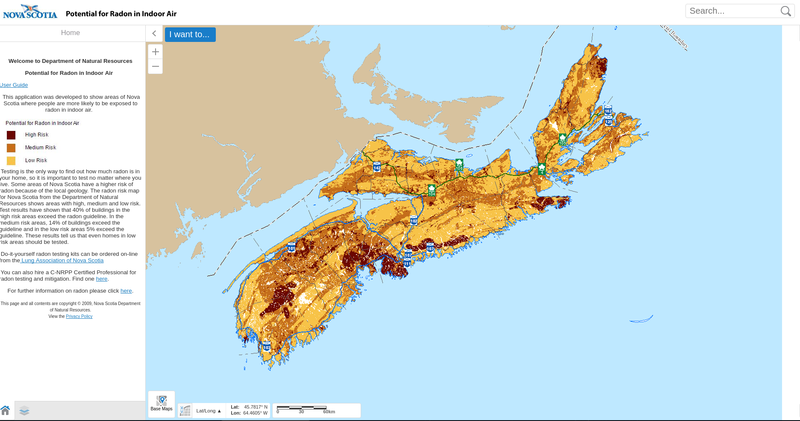 Nova Scotia has developed and released a map outlining the risk of radon exposure based on environmental factors (https://novascotia.ca/dhw/environmental/radon.asp). These factors were equally weighted to produce the outcome of radon risk and relied on airborne uranium, geological bedrock, and soil permeability. Each of these three input weights were assigned an individual risk rating based on their capability to produce or mobilise radon. The sum of each individual risk factor provides an overall risk score. I had the opportunity to run a sensitivity analysis on this spatial risk mapping to test various input weight scenarios. We were curious if any of the three inputs provided a higher risk of radon exposure when compared to the other factors. For example, does a type of bedrock that is at high risk of radon release still provide a high risk if it’s encased in a impermeable type of soil? 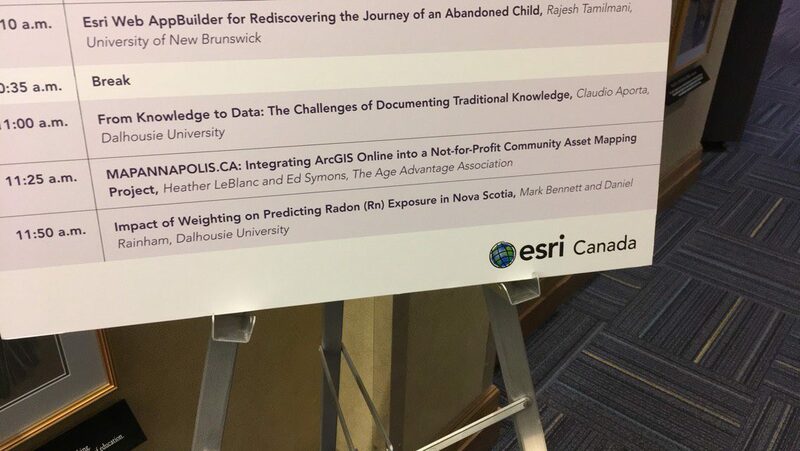 I was able to present these findings at the Esri User Conference in Halifax, under the title of “Impact of Weighting on Predicting Radon (Rn) Exposure in Nova Scotia” (presentation slides). Ultimately, the results pointed to the input weighting having a significant impact of the predicted risk within Nova Scotia and helps provide a framework of evaluation for other provinces looking to predict radon. A few other Canadian provinces are making strides to model the spatial distribution of radon risk, and support the strong public health campaigns to get houses tested. This project provides a great mixture of geo-statistical methods and the application to a pressing public health issue. Our partners at the Nova Scotia Department of Natural Resources were fantastic partners to work with and provide insight into the geological drivers behind the risk of indoor radon exposure. Comparing these various risk models to a collection of gathered indoor radon measurements allowed the team to validate the differing input weights against real values. In addition to supporting this project these partners are a strong voice in the protection of Canadians from radon exposure, and lowering the risk of lung cancer in households. Having the chance to present these findings at the Esri User Conference was an excellent platform to discuss the findings and methods behind the analysis. In addition to these, it’s always great to learn more about how others are using ArcGIS to accomplish their work.